While writing has never been a pleasure for me, I have enjoyed creating these Random Happenings posts. I hope those reading at home have also enjoyed hearing a bit about our routine life in 2014. I plan to continue in 2015 if for no other reason than to remind myself about all the things that happen, both large and small. Unfortunately I did not manage to write the detailed posts on various topics I promised in 2014. I have hopes to manage one or two, but my track record says to not get excited about those anytime soon. We’ll see if I do better in 2015. We started November with an unusual experience, as we biked with our friend Dave. While biking and friends is not unusual, this particular set of circumstances made it special. Dave lives in the Chicagoland area and he had traveled to Germany for a business trip. 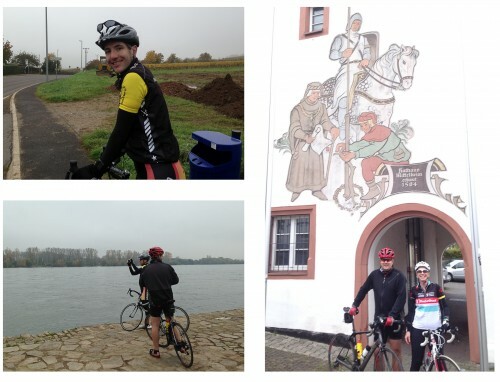 Will and I drove over to his hotel with three bikes and we enjoyed a long and cold ride around western Germany. It was fun to be with Dave as he experienced more European cycling, although the weather could have been a bit better. 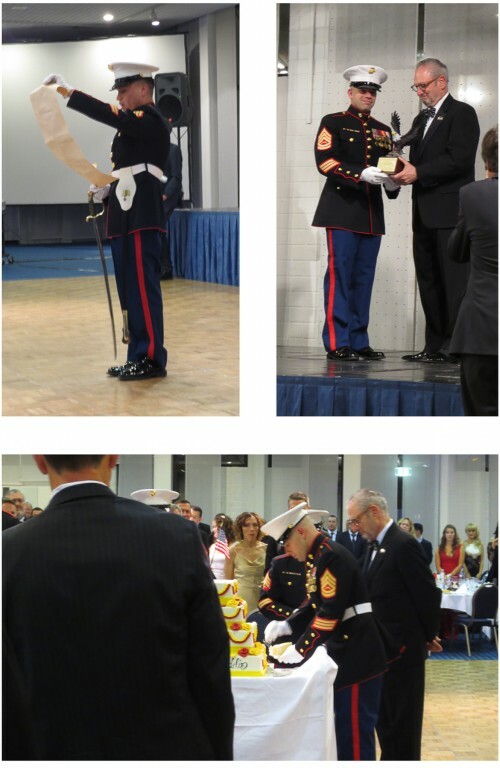 The second weekend in November we attended our fifth Marine Corps Birthday Ball. We always have a great time at the ball and this year was no different. We were sad that several friends were unable to attend, due to the fact they had moved away from Luxembourg or were out of town. In mid-November we departed Luxembourg for our annual trip back to the US. With the exception of one trip a couple years ago, our travel to the US has been mostly uneventful – which is exactly how you want it. However, our flight to Chicago this year had a very unusual event. We had to turn around for a medical emergency and make an unscheduled landing in Amsterdam. 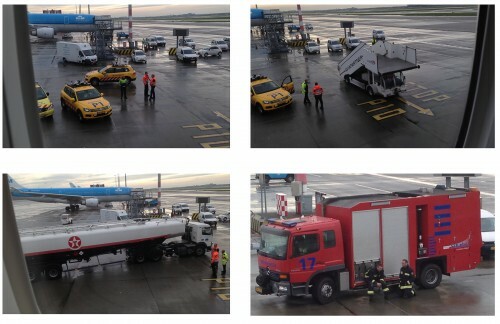 In order to land, the plane had to dump fuel. We circled over the North Sea for a bit to get rid of the fuel, then we landed at Schiphol. The plane taxied out to a remote spot in the airport and the emergency vehicles joined us there. From my seat, I had a great view of all the action. The passenger in medical distress was off the plane and into an ambulance in short order. However, the refueling took about 45 minutes. All in all, we landed only 2.5 hours later than scheduled. The crew did a great job of keeping us updated about what was happening and about how long it would take. We hope the passenger is doing much better now. Our time in the US was a whirlwind but we had a great time. We had 1.5 weeks in Lake County, which allowed me some quality time at the office plus as many meet-ups with friends as we could manage. The second week was spent with family, first downstate with my family and then with Will’s family in Cook County. It was different this year, since Will’s parents moved from the St. Louis area to the Chicago area. Not just different, but much better! 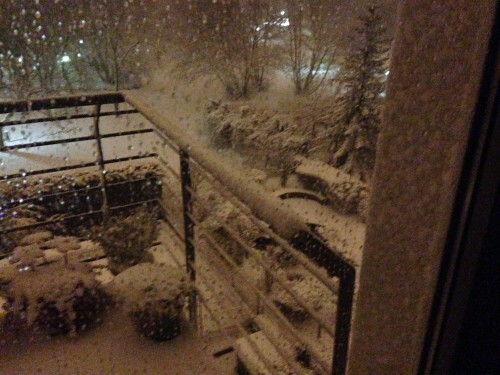 We returned to Luxembourg at the beginning of December. We had barely gotten over our jet lag before we said goodbye to another friend who was leaving Luxembourg. It takes a special guy to throw his own going away party, but Tim did it in style. We wish him great luck and fortune in his next location. The next day, we headed up to the Netherlands to meet our friend Jaime. She was flying in for a meeting and had a couple free days, which meant we had some time for fun in the NL. 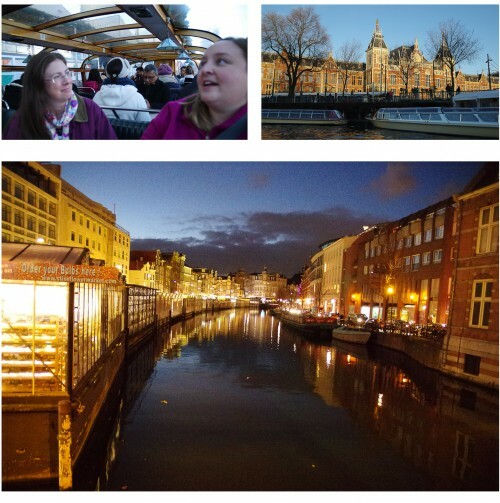 We showed her around Amsterdam on Saturday, ending the day with dinner at a Peruvian restaurant. The weather could not have been better for sightseeing. On Sunday, the weather was not nearly as nice. 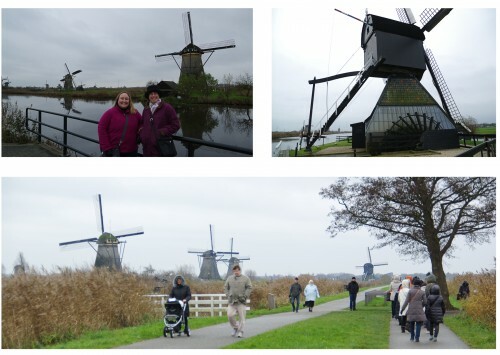 Jaime decided that seeing the windmills of Kinderdijk would be more fun than anything else we could come up with. Kinderdijk holds a special place in our hearts, as it is where Will’s family lived prior to immigrating to the US. The weather wasn’t much better there, but we still had a great time. It was the first time I had been to Kinderdijk since 2004 so I enjoyed the visit nearly as much as Jaime! One of many reasons I enjoy spending December in Luxembourg are the Christmas markets. I enjoy our market in Luxembourg for the food and convenience but I also enjoy traveling to other spots. The best part about the market to me is going with friends. One Friday night we met friends at the Lux market for dinner and visiting. We enjoyed catching up, while walking around with our gluhwein. Will even tried the one that they set on fire! The next week colleagues from Chicago were in Luxembourg for meetings. After business was finished, Will escorted us to Trier, Germany for the markets there. Trier is bigger than Lux, but not as grand as Cologne, Aachen, or Strasbourg (FR). However, due to the travel schedule of my colleagues it was the best we could manage. It was the first visit to a Christmas market for both of my colleagues and they enjoyed themselves tremendously. I finally purchased my first Christmas pyramid after years of consideration. I love it! Later in the month I went to Aachen, Germany with friends. In 2013, we went to Strasbourg together and had a fabulous time, so we decided to continue the tradition with another market trip. Will had caught a virus and was too sick to go, so it was three of us that ventured out. Aachen was a nice market, although I hear Cologne is even better. We’ll have to confirm that next year! 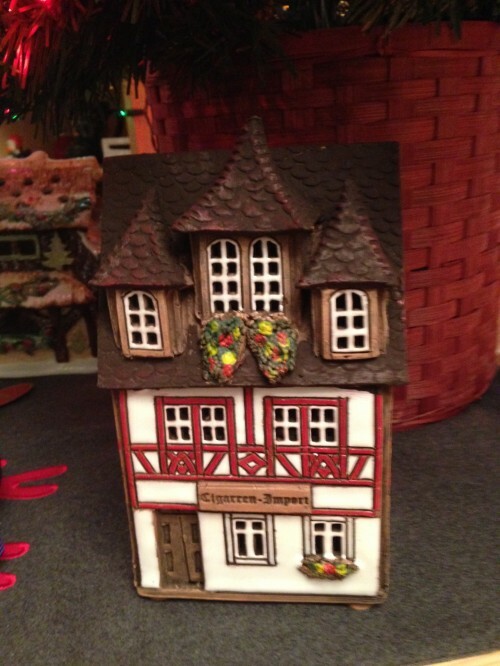 I also started my Christmas house collection with my first purchase in Aachen. Will wasn’t thrilled that I was gathering even more holiday paraphernalia, but he did like my choice. I can’t wait to involve him in the decisions next year. Due to the timing of the public holidays, I was able to be out of the office the last two weeks of December. Those two weeks are some of my favorite time of the year, as we stay home and enjoy simple living in Luxembourg. 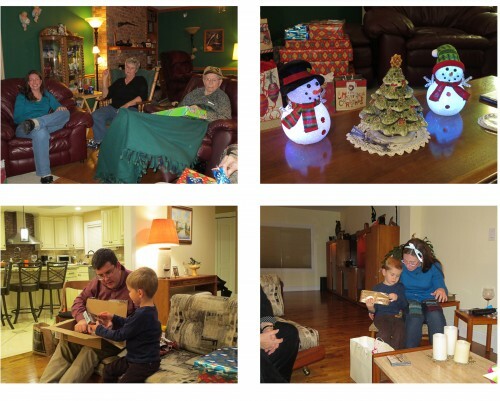 We celebrated the Christmas holidays with our Luxembourg “family.” Rachel already posted about it with great photos, so I’ll let her tell you about it. We also watched the entire series of Breaking Bad. We have thoughts about that, but I’ll spare you them now. Finally, we attempted to get Will a new mobile phone with limited success. That will be special post once the situation is resolved. We rang the in new year with fireworks provided by our neighbors. 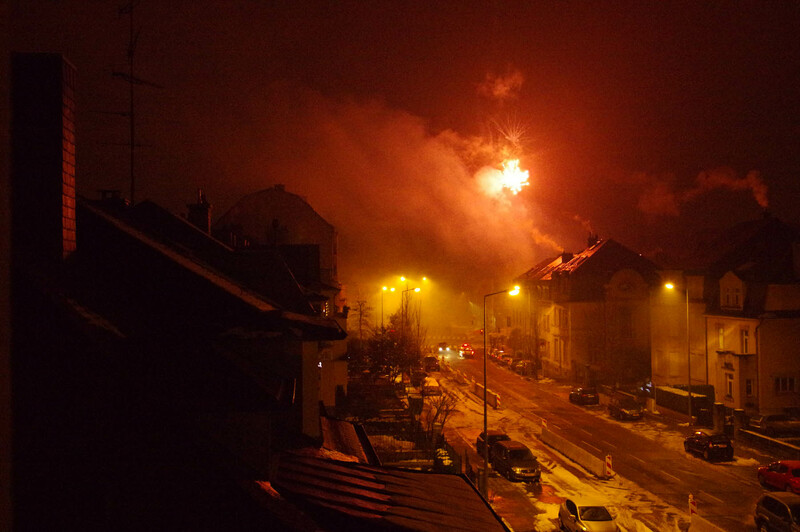 It was the first time we had celebrated new years in our own apartment (versus being out with friends), so it was fun to see the celebration from our balconies. Will tried hard to capture some of the fireworks and I think he did a good job! Please enjoy these random photos from the phone to close out the year. 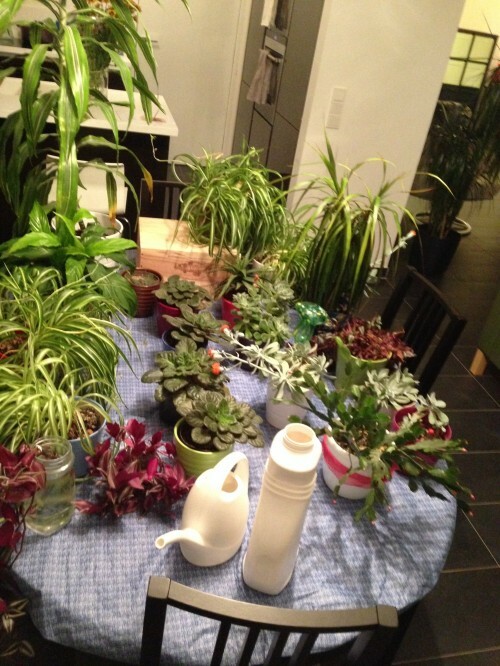 Our friends watered our plants while we were away. We try to make it easy on the plants and our friends. 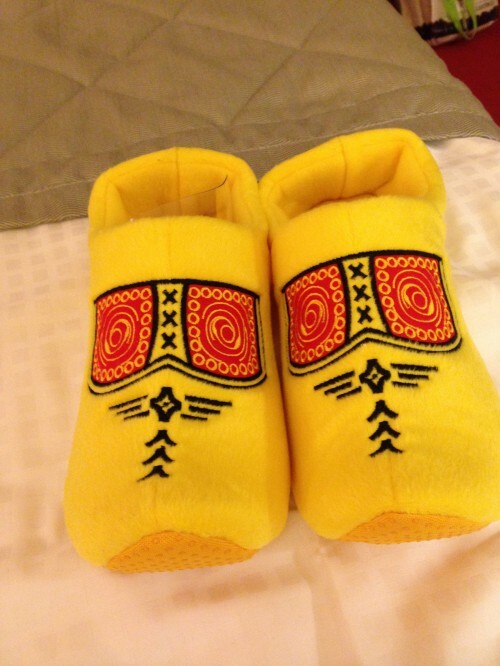 I waited over 12 years to get these slippers. They are silly, but I love them. 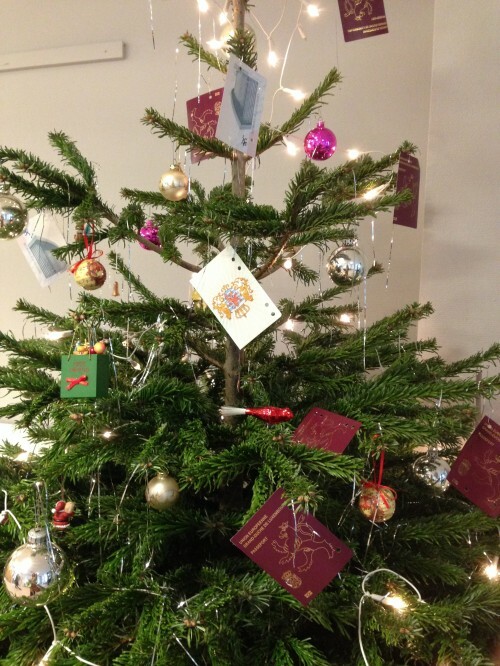 During one of my visits to the apostille office, I noticed the passport group had some unique ornaments. I wanted to nip one, but stealing is wrong (sigh). We finished 2014 with some proper snow. It was absolutely beautiful, especially after the sun rose. Wonderful!!!! So enjoyed sharing this with you and especially enjoyed getting to be with you both in November! I love these, and I am glad I was able to ride with you. Riding in Europe is much different than riding in Illinois. We have flat straight roads with lots of wind and pick up trucks. You have windy, hilly roads with aggressive European drivers. It was fabulous. I also like that you documented the classic Bakker moment, the picture of the person taking a picture! great memories for all of us.